Well hello there! I hope Monday has been treating you well! As I mentioned in my last post, I've been a bit (very!) stressed and busy at work lately, but luckily last week I had a couple of days where I could leave on time, and my energy levels were high enough that I could go to the gym, have dinner with my folks, do the laundry, and even bake a cake! (And on one night I actually managed to do all of those things - woohoo for productivity). 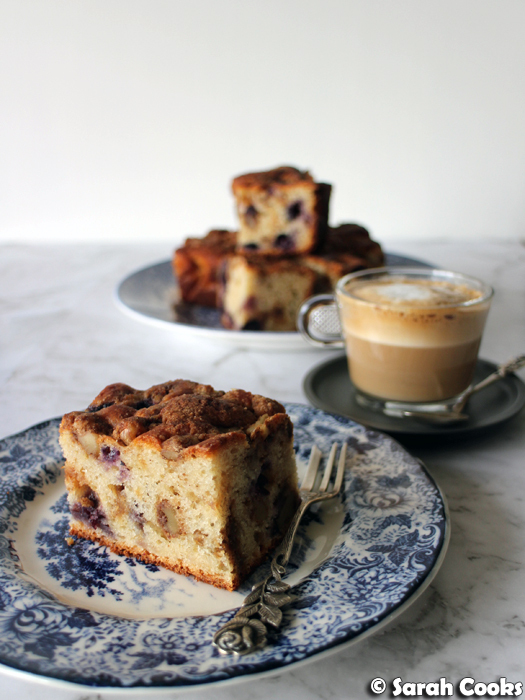 The cake in question was this lovely blueberry walnut streusel coffee cake. However, baking this particular cake wasn't just for fun. I had a series of early morning meetings last week, and I thought it would be a good idea to have a delicious breakfast on hand. This was to save time in my morning routine so that I wouldn't run late, and also to make sure I had sustenance (both literal and figurative) for the meetings. It's so much harder to concentrate when you're un-caffeinated and hungry! Given that today is Monday, and that I baked this cake for a week of breakfasts, I was tempted to make this a Meal Prep Monday post - tee-hee-hee - but I don't think it quite fits in with all my sparkly vegetable-filled meal-prep lunches. I am aware that cake is not the healthiest option for breakfast, but I figured it was no worse than buying a pastry with my morning coffee. (Which I also have been doing a lot of lately). Let's look at the cake! 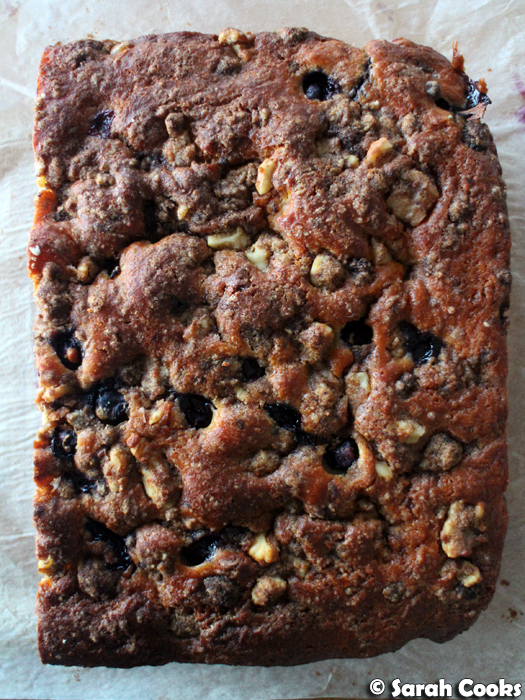 It's a simple butter cake with a sweet and crunchy walnut streusel, fresh juicy blueberries and just a hint of spice. The inspiration for this cake came from an episode of Bake with Anna Olson I happened to watch a few weeks ago. Do you know Anna Olson? She's awesome, and I'm a big fan of her shows! She's a Canadian pastry chef (and violinist, apparently) who has programs on the Food Network. She has a really old-school style of program - she stands behind a counter and demonstrates the recipes, usually starting with a basic version of a recipe, and then doing a few fun variations on the theme. It's all about the recipes! The episode I watched was all dedicated to coffee cakes. Coffee cakes! For anyone who doesn't know, North American coffee cake is a type of cake that is traditionally served with coffee, not necessarily with coffee as an ingredient. (Much like a British tea cake, come to think of it, which is eaten with tea, but doesn't have tea as an ingredient). The cake part of coffee cake is a sturdy butter cake, usually with sour cream in the batter, with a nutty or crumbly streusel folded through or sprinkled on top, baked in either a slab or a bundt tin. Yum. Funnily enough, Sandra got really annoyed because Anna kept saying "streusel" throughout the program, pronouncing it in the North American way (STROOSEL), as opposed to the German way (STROISEL), and she said it like a hundred times! But, we powered on through, and I came away with coffee cakes on the brain! So, my cake is essentially a variation on Anna's basic Sour Cream Pecan Coffee Cake - except I used walnuts instead of pecans, and full-fat Greek yogurt instead of sour cream. (I had both of these ingredients on hand!) I also added some fresh blueberries, and baked it in a big slab of a tray (23 x 27cm), rather than the 23cm square that she suggests. Winner winner, it turned out great! 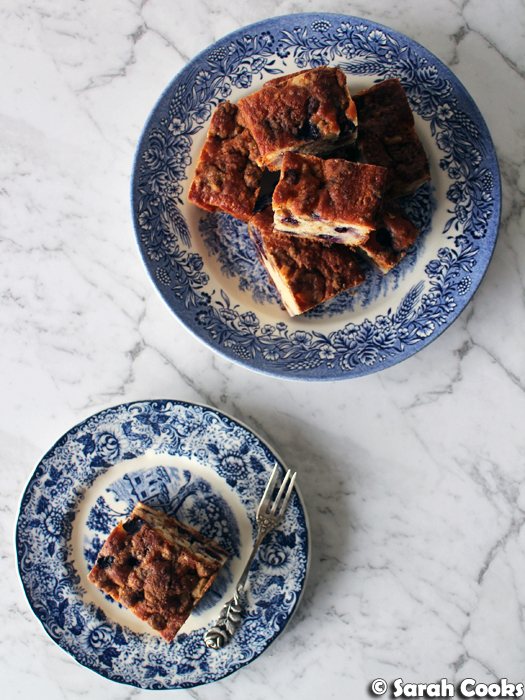 Anna's recipe suggests a hint of allspice in the batter, as well as cinnamon in the streusel, which gives it a lovely warm aroma, and makes it much more interesting than just a plain cinnamon cake. The blueberries added a fresh sweetness, and the walnut streusel was wonderfully crunchy and sweet. I loved it! Looking at the cake, I was worried there might not be enough streusel (STROISEL!) As you may be aware, I'm all about the contrasting crunch. Crunchy shortbread biscuits with gritty bits of ground rice inside? Yes please. Apple crumble that's 90% crumble and 10% apple? Heck yes. 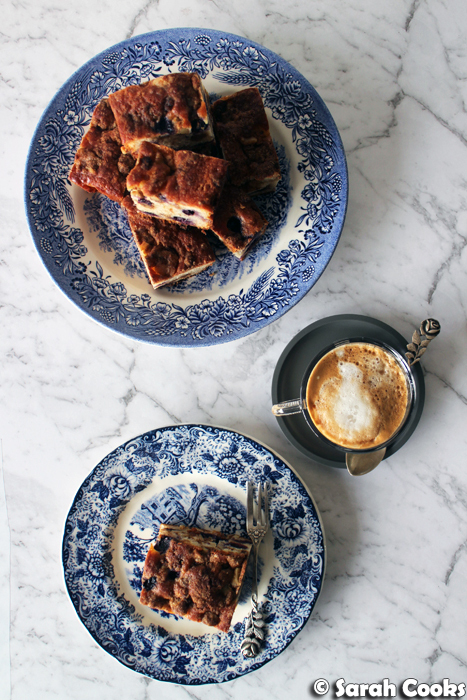 You may also remember a previous coffee cake I've posted, the Blueberry Crumb Coffee Cake, which had a pretty significant layer of crumble on top. However, there was definitely enough crunchy streusel (STROISEL!) to provide a pleasing contrasting crunch. 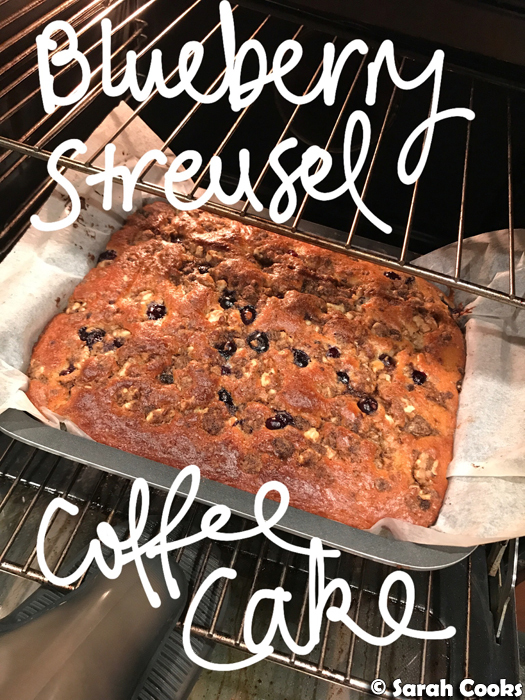 As this streusel (STROISEL!) mixture is primarily walnuts, with just a little sugar/butter/flour/spice to bind, it's properly crunchy, and strongly flavoured. Any more and I think the cake would have been too sweet. How could I have doubted Anna's ratios? This was a perfect treat of a breakfast. It was good with tea, but definitely best with coffee. I had some for breakfast throughout the week, afternoon snacks, shared lots with colleagues, family, and friends. My dad pronounced it "Delicious!!!! ", with four exclamation marks, and said that I am indeed a "kitchen goddess!!!" (Only three exclamation marks there, but I'd still consider that high praise). My friend Jenni gave it an all-caps "AMAZING", and a "deeeeelicious" with four e's. She also said it made a good midnight snack. If you're going the midnight snack route, might I suggest decaf? However you eat it, I hope you enjoy it! Preheat the oven to 175C. Line a 23 x 27 cm rectangular pan with baking paper. (This is an odd size, it just happened to be the size of baking dish that I have. A 23cm square cake tin should be fine, it might just take a little longer to cook as the batter would be deeper). To make the streusel, mix all the ingredients together and set aside. To make the cake, sift the flour, baking powder, salt, baking soda and allspice into a mixing bowl. In a separate bowl, whisk together the butter, sugar, Greek yogurt or sour cream, eggs and vanilla. Pour the liquid ingredients into the dry ingredients and whisk gently until evenly blended. Spread half the batter into the prepared baking dish. Sprinkle half the blueberries and half the streusel mixture on top, and swirl these in using a butter knife. Spread the remainder of the cake batter on top, then add the remaining blueberries and streusel and swirl in again. Bake for 45-55 minutes, or until cooked when tested with a skewer. Allow to cool before removing from the tin. Slice into generous slabs to serve. Wow! I would definitely try this. Thanks for sharing the recipes. This is a truly delightful cake recipe, Sarah! Is it better to use fresh or frozen blueberries? Thank-you Agness! I think either fresh or frozen would be fine - frozen would probably tend to squash less in the batter, but I've baked cakes with both fresh and frozen and they turn out well!